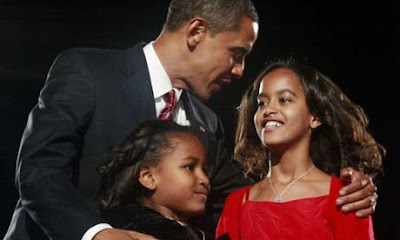 Time to learn the names of the kids of our new first family: Sasha and Malia. Puppy to be named later. Seriously John, thanks for all you did in pushing for Obama. I love you for doing all you did. I can't wait to see some class and dignity in the White House again. And to all the people out there who are saying Obama was only elected because "the blacks came out to vote", I have two words for you: Alan Keyes. I stood in line for half an hour with African Americans and Asians and Anglos, all of us infected with this sense that today, in this moment, the real America stood up, patiently but determined, peaceful yet resolute, and said "enough". There was real sense that in this simple act we were participating in a moment to tell our children and grandchildren. That's the magic of the American system. Amazing. Prayers for President elect Obama, that God would give wisdom, protection, and every blessing. Also, that our country would be able to come together. I keep bursting into tears! Good, good news! Thank you all! !